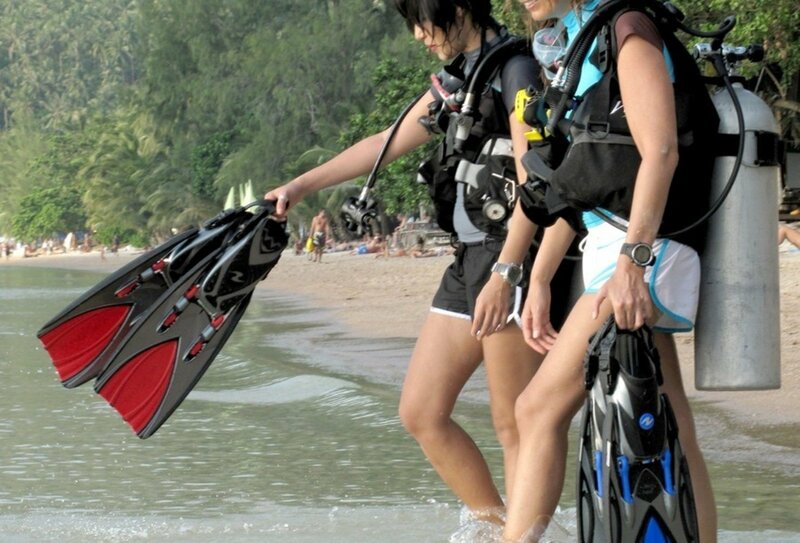 Join our PADI dive school in the tropical oasis of Koh Tao island in Thailand. 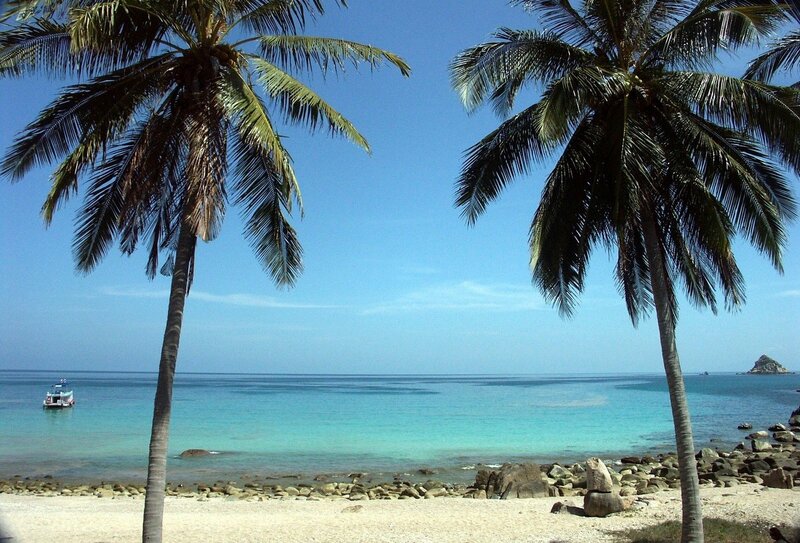 Your aquatic adventures will begin as you learn how to scuba dive on this beautiful Thai island. Learning amazing new diving skills against an incredible backdrop of idyllic scenery, you will discover the wonders of an underwater world, learn new skills and enjoy relaxation on the beach and lively nightlife in this tropical spot. 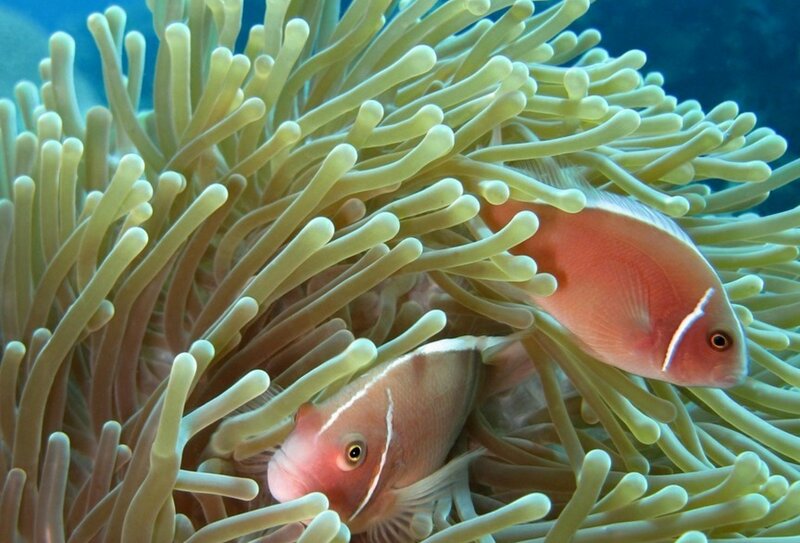 Some fish swim amongst anenomes in the clear blue seas of Thailand, a fantastic place to learn to dive on your gap year. A beach in Koh Tao, Thailand, one of the most beautiful places to visit on your gap year. 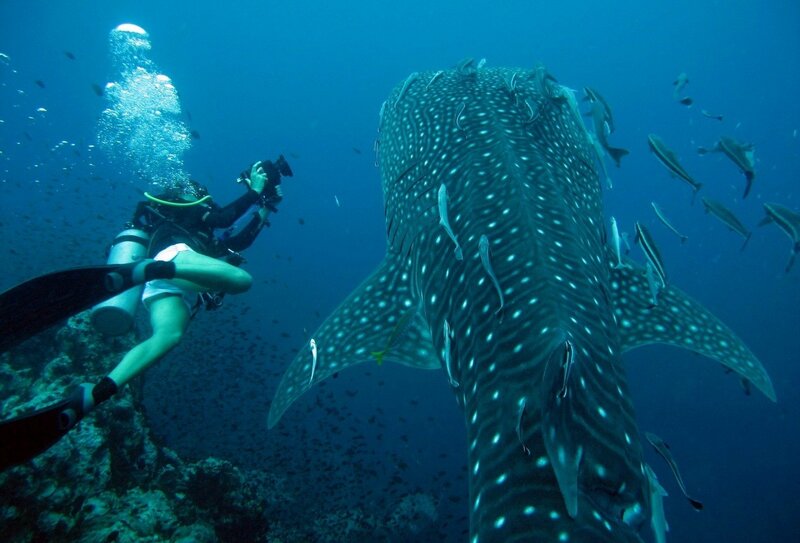 A scuba diver swims alongside a whale shark in Thailand, the world's biggest fish species. What an incredible gap year experience! Two gap year travellers wade out into the water as they prepare to scuba dive in Thailand on their gap year. A young man prepares to dive underwater on his gap year to Thailand. A girl wears her scuba gear, excited to learn to dive in Thailand. 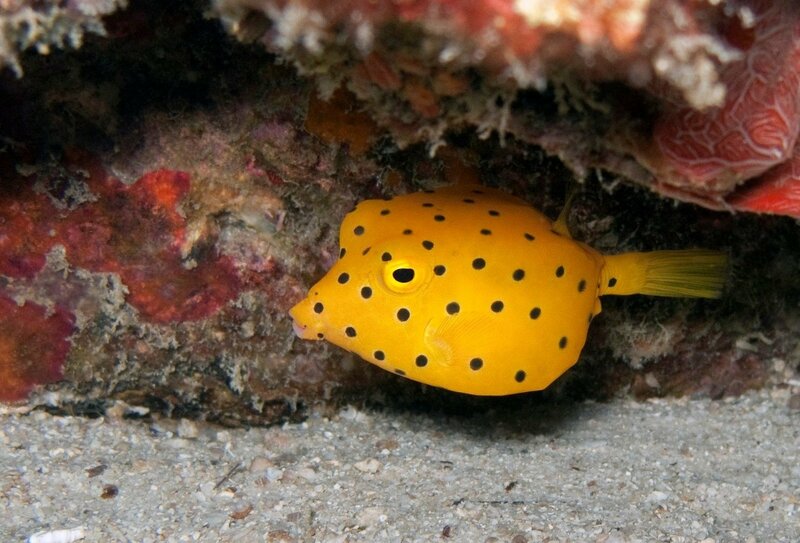 A yellow boxfish, a very distinctive yellow fish with black spots, which can be seen under the clear blue seas of Thailand. 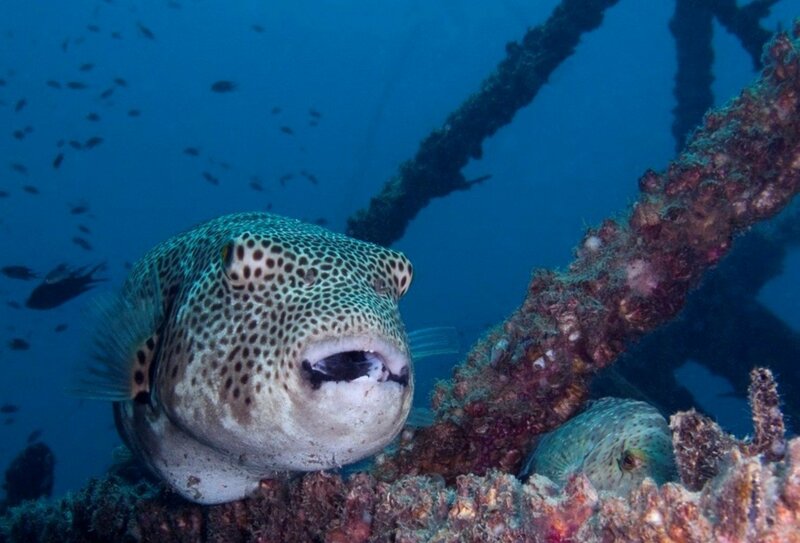 A puffer fish swims amongst the wreckage of a ship in Thailand. 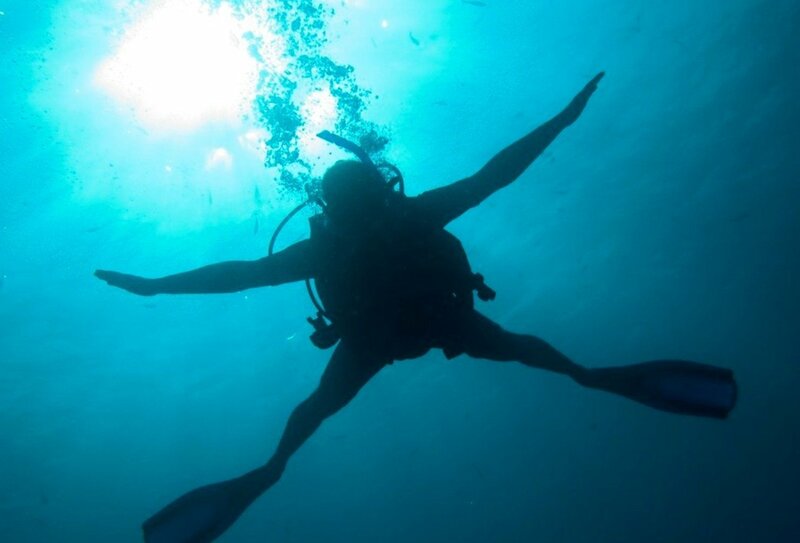 A silhouette of a man scuba diving in Thailand. 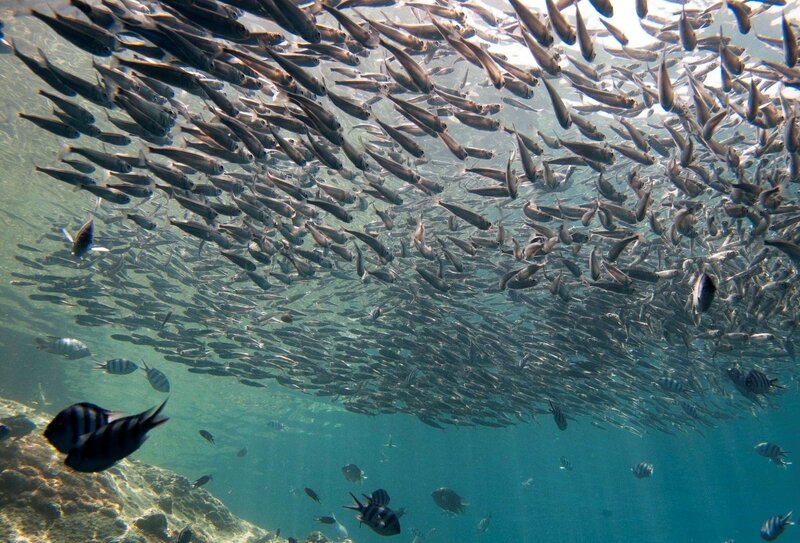 A huge shoal of sardines, which can be seen in their hundreds of the shores of Thailand when you learn to dive on your gap year. As you should have flown into Bangkok at least the day before this (in order to adjust to jetlag or spend your first Thai night in Khao San Road), you’ll pick up your inclusive VIP boat and bus transfers from Khao San Road, and arrive at Koh Tao island by early to mid afternoon. Bobbing up to Koh Tao pier you’ll be met by our dive school crew as you step off the boat, and be taken to your island accommodation just minutes from Sairee Beach and the dive school. For the rest of the day you’ll be free to chill out, explore and enjoy settling into your accommodation. At just a short distance from the dive school itself, during your stay you’ll have full access to a beach, bars restaurants and cafés, and should find everything you need, as well as some incredible Southeast Asian scenery. Waking up in paradise on day two of your scuba stay, you’ll have the morning to acquaint yourself with the island and your fellow Thai travellers before joining a welcome orientation at 4pm where you’ll get to know a little more about the area, meet your diving instructors and dive buddies, fill out some paperwork, and watch your first dive DVD. Afterwards the evening is free for you to track down some tasty Thai cuisine. Your new instructors will be more than happy to recommend a few places, but don’t eat too many noodles, as you’ll still need to fit into your wetsuit and not sink straight to the ocean bed the next day! Beginning to master the aquatic arts and submarine skills of scuba diving, at 09:00 on your third day you will meet up with your instructor to start some basic instruction. Learning the basic diving principals in a fun and relaxed theory session in the morning, you can adjust to the world of the wet in the afternoon as you try out your dive equipment and practice your first underwater breaths. Building up your confidence through brief bursts of bubbles, and by taking part in basic dive exercises, you should soon have the skills to explore the underwater world! Day four will follow a similar structure to day three, in that you’ll start with a morning of scuba theory lessons, followed by an afternoon of diving. Today differs from day three however as you’ll be taking your first two open water dives! 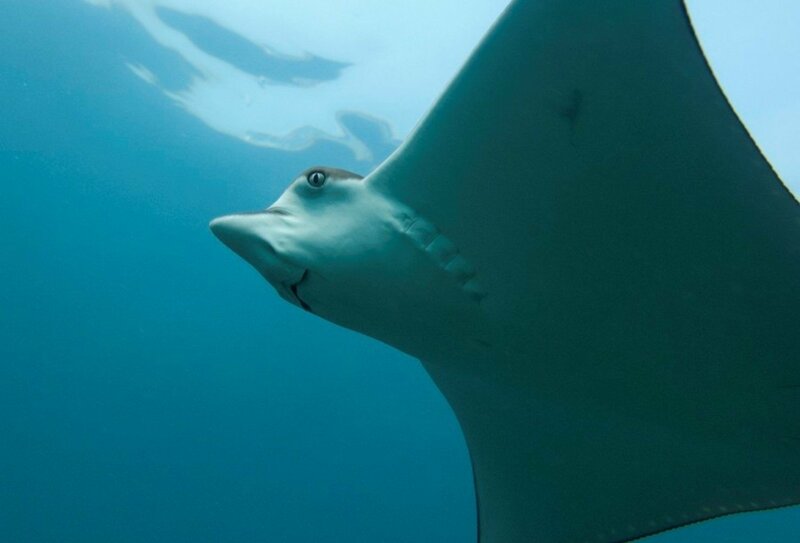 Taken in shallow water so you can gradually get used to the watery wonderland of the ocean, this is your chance to feast your eyes on some fantastically fishy wildlife! By the end of the day you should be well on your way to mastering your scuba skills, and can spend the evening getting ready for your last day on the course! Completing your theory lessons in the morning, you’ll top off your Thai diving trip with two last plunges into the briny blue in the afternoon. After splashing back onto land in the evening, you can peel off your wetsuit and relax with your other dive buddies, watching an underwater video of your aquatic antics, and kicking back on Koh Tao’s beaches with a celebratory beer or three! As of today, you’ll be a fully certified PADI open water diver, and can explore the underwater world of decadent dive spots around the globe! Waking up for your last morning on the island, you can either check out of your accommodation and head back to the mainland, ready to travel on around Thailand, or alternatively extend your stay (at an additional cost) to make the most of this incredible island spot and your new diving skills! One of the main reasons people like to stay on after the end of the course (aside from the stunning scenery and decadent diving) is to take advantage of some of the islands incredible activities. From rock climbing, tai chi, yoga, meditation, cookery classes, flying trapeze trips, bowling, hiking, kayaking and more! People often party their way through their island stays and extend upon their original plans, island hopping to other tranquil spots around the area. If you need help or advice on extending your stay, please do not hesitate to contact us. Please note that if you do wish continue your travels, you will not be able to fly for at least 24 hours after your last dive trip. This means that the earliest you should fly is 12 pm (midday) the day after the end of your course. You should also note that we use a number of different dive schools on Koh Tao Island in order to guarantee you a placement and accommodation during the busier seasons. All of our selected dive schools are of the highest quality and vary between five of the top dive centres. This itinerary is subject to change and your dive instructors reserve the right to adapt schedules and events in order to suit the group and environmental circumstances, such as adverse weather conditions. As issues of group and individual health and safety will always be at the forefront of your instructors mind, your itinerary may therefore change and remain dependant on issues outside of their control. This programme doesn't run during November's monsoon season. To begin your Thai travels, you’ll need to arrive into Suvarnabhumi Airport (BKK) in Bangkok. You should arrange your flights so you arrive into Bangkok at least a couple of days before your programme start date. We recommend that you spend your first night(s) in Bangkok, and simply take a taxi to a hotel in Khao San Road. This way you’ll be well rested and very close to our bus meeting point, which will take you from Khao San Road to your ferry connection the next day. We can recommend great places to stay in Khao San Road. A bus and boat transfer from Bangkok to Koh Tao can be included as part of this programme. On the day your programme starts, you will jump on our bus and travel from Bangkok to your boat transfer to Koh Tao. Leaving Khao San Road at 05:00, the bus service will get you to the ferry terminal on your first morning, where you’ll take the 12.30 catamaran to Koh Tao Island. Reaching the island at around 14:00, our scuba diving staff will meet you off the boat and show you around the island and your accommodation. If you do not need the Bangkok transfer, for example if you are already travelling in Thailand, you can book this trip minus the transfer, and make your own way to Koh Tao. 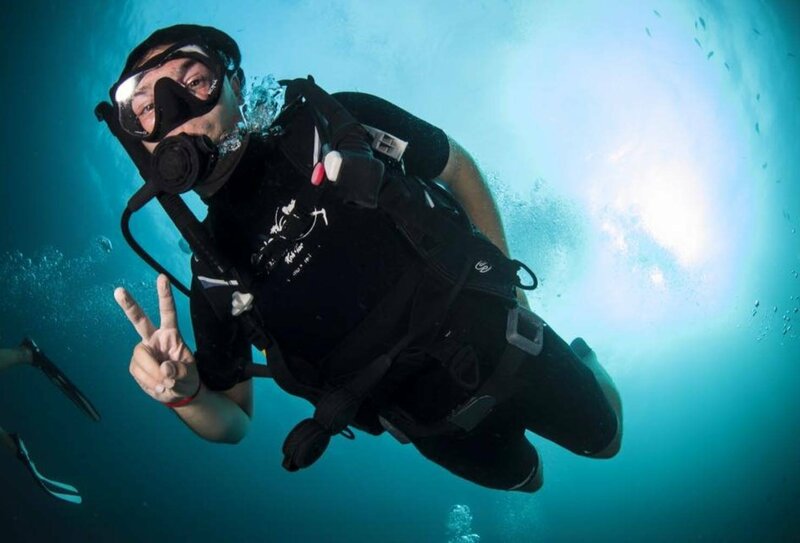 If you are making your own way we ask that you inform us of your arrival time on Koh Tao and your preferred start date for the Learn to Dive programme. Accommodation during your five days on Koh Tao Island is included, and when you’re not blowing bubbles, you can chill out in a private fan room (twin share). The rooms are comfortable, secure but basic which are just a minutes away from the dive school and the most tranquil of Thai beaches. As meals are not included during this trip you will need to bring a little extra money to cover your costs. With your accommodation just a short walk from Sairee Beach and village however, you’ll be able to find a number of shops, bars, internet cafés and restaurants which serve up a range of tantalising Thai and Western cuisine. Meals are generally available quite cheaply, so you and your dive buddies should soon find enough delicious food to fill up your wetsuits! As the Koh Tao scene is rich in beach bar nightlife, you might also like to keep some cocktail cash aside for the evenings, where you can swap the life aquatic for a night on the town! The minimum age to join this Thai trip is 18. The allowed duration of your trip varies depending upon how you plan to arrive into Thailand. Without a visa, British nationals arriving by air can remain in the country for a maximum of 30 days, though if you arrive across a land border you can only stay for 15 days. If you wish to stay for longer, or plan to begin employed work during your stay, then you will need to apply for a visa before you depart the UK. If you are not planning on working this will be in the form of a 60 day tourist visa. For more information, please contact us. Please note that Thailand has quite strict rules over the duration times on visas, and if you overstay your authorised time, has equally strict reprimands. If you allow your visa to run out and do not have an extension on your stay, you could be heavily fined, be held in detention, deported back to the UK (at your own expense) and even blacklisted and banned from re-entering Thailand. Visas, extensions, and any form of entry permit must always be obtained from an official Thai Embassy or Consulate, so you should be aware that any paperwork not obtained as such will be illegal, and will place you in further trouble, possibly leading to criminal proceedings. No matter what your age or experience, as long as you are in good health then this dive trip should have everything to suit your submersion needs! Unlike courses in other countries, if you choose to dive in Thailand you will not need a signed medical certificate from a doctor. Certain medical conditions should still be taken into account however, as this should not be seen as a free reign to endanger yourself. Sufferers of conditions such as epilepsy and diabetes will all require an authorised doctor’s note and permission before they will be allowed to join the course. Please Note: If you suffer from asthma, you will unfortunately not be eligible to scuba dive. If you are pregnant or have other heart and lung conditions you may be unable to dive, and should contact your doctor for advice. Regarding your fitness level and water confidence, as long as you are able to swim 200 meters and can tread water/ float for at least 10 minutes you will be fine to join the course.